Two delegates from the Joint Inspection Unit (J.I.U.) of the United Nations System based in Geneva, visited Samoa last week. During their five-day mission, Inspector Jean Wesley Cazeau, and Nuria Castells, Evaluation Officer, analyzed the support that the United Nations system is providing to the government for the implementation of the commitments made at the Small Islands Developing States (S.I.D.S.) Conference - held in Apia in September 2014 - and also, most recently, through the adoption of the 2030 Agenda for Sustainable Development. The information compiled will be included in a report aimed at assessing the effectiveness of the United Nations role as well as the institutional set-up for sustainable development of Small Islands Developing States around the world. After a round of meetings held with the Prime Minister, C.E.O.s of Government Ministries, Diplomatic Corps, relevant development partners and representatives of the civil society, the two delegates attended a field visit to see the impact of U.N.’s work in the country. Last Friday, Mr. Cazeau and Ms. Castells, accompanied by the U.N. Resident Coordinator, the Director of U.N.E.S.C.O., the National Coordinator of I.L.O. and other U.N. staff, visited three different sites. The day started at the Ministry of Natural Resources and Environment (M.N.R.E.) with a presentation of the 3D models created by communities as part of the Integrating Climate Resilience Integration of Climate Change Risks and Resilience into Forestry Management in Samoa (I.C.C.R.I.F.S.) Project. The project, supported by the United Nations Development Programme (U.N.D.P. 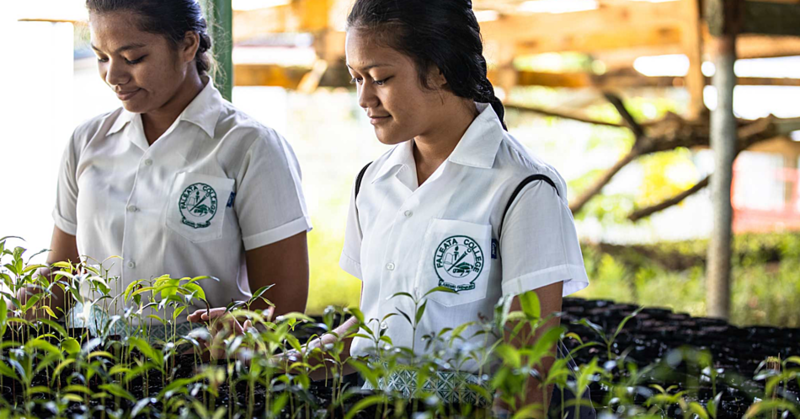 ), aims to increase the resilience and adaptive capacity of Samoa’s forest areas and dependent communities to the threat of climate change. Next, the group went to Falese’ela Village, on the southern coast of Upolu, where the community - with funding from the U.N.D.P. 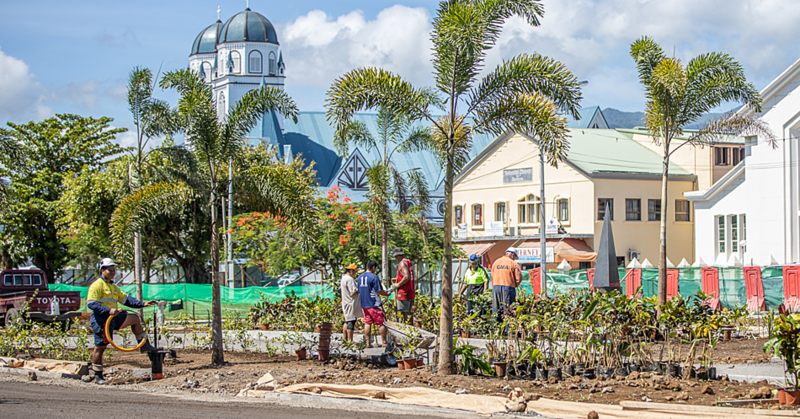 Small Grants Programme - is preserving the environment and investing in an eco-tourism initiative. The Falese’ela Watershed and Rainforest Sanctuary epitomizes the ridge-to-reef concept, an area of around 100 acres of pristine waterfalls, crystal clear streams and rivers, lush vegetation but under threat from human habitation and agriculture. The village has developed a 3D model of the vicinity which has contributed to the community’s understanding of the areas’ vulnerabilities. 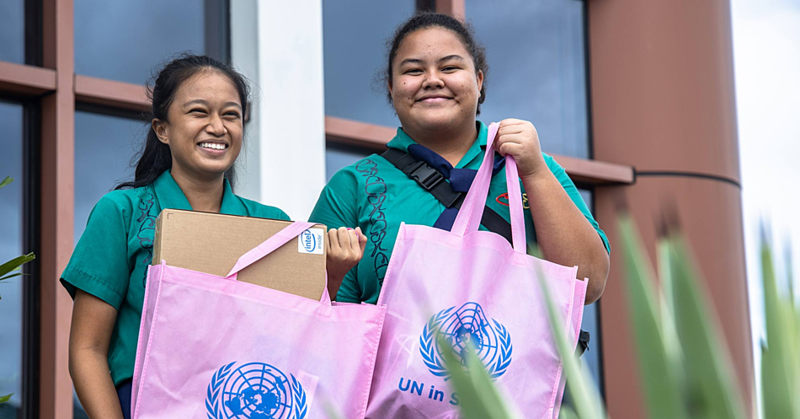 Afterwards, the delegation drove to the Samoa Cultural Centre at Falelauniu, 10km south of Apia, where they learned about the One-U.N. Youth Employment Programme led by the Division for Youth of the Ministry of Women, Social Community and Development, with support from six United Nations agencies (I.F.A.D., I.L.O., F.A.O., U.N.D.P., U.N.E.S.C.O. and U.N.V.). Maulolo Tavita Amosa, Director of Samoa Culture Centre, welcomed the visitors with a sumptuous lunch served by young Samoans dressed in traditional wear. As part of the Youth Employment Programme, earlier this year, twenty young men and women graduated from a training on traditional Samoan arts. Ten youth are now being paid by the Samoa Culture Centre to host guests during their visits while the others have secured employment in the cultural industries by using their certificates as a qualification. 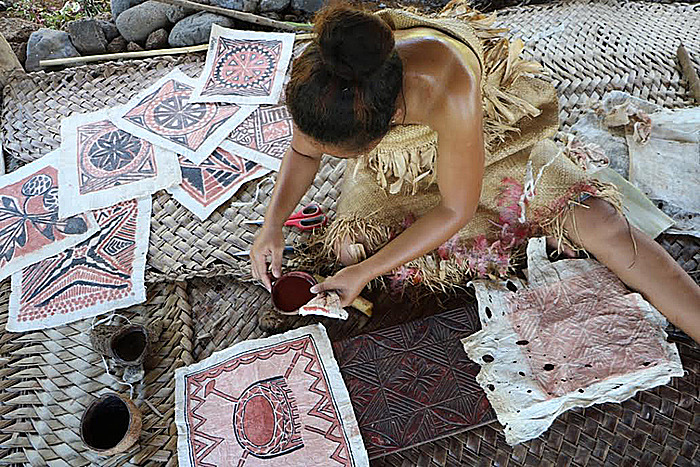 After lunch, the visitors were guided through various work stations where they witnessed the beauty of Samoan cultural heritage and fine arts such as siapo (tapa) production, mat weaving, coconut oil preparation and canoe making. The visit concluded around 4:00pm with a traditional farewell ceremony (ta’alolo).